As a newly independent state, Kazakhstan quickly agreed to full nuclear disarmament and became an active participant in the major nonproliferation treaties and regimes. When the Soviet Union collapsed in December 1991, Kazakhstan inherited 1,410 strategic nuclear warheads deployed on R-36M (NATO designation SS-18 "Satan") intercontinental ballistic missiles (ICBMs); X-55 (NATO: AS-15A "Kent") air launched cruise missiles (ALCM); and an undisclosed number of tactical nuclear weapons, making it the fourth largest nuclear weapons possessing state in the world. The newly independent Kazakhstan quickly agreed to full nuclear disarmament, however, and became an active participant in the major nonproliferation treaties and regimes. Immediate efforts included the signing of the Almaty Declaration (29 December 1991); the Lisbon Protocol (23 May 1992); ratification of START I (2 July 1992); and membership as a non-nuclear weapon state in the Treaty on the Non-Proliferation of Nuclear Weapons (NPT) (14 February 1994). By September 1996 all of Kazakhstan's nuclear warheads, ICBMs, ALCMs, and Tu-95s were either destroyed or transferred to the Russian Federation, and by September 1999 all of Kazakhstan's ICBM missile silos had been destroyed. Kazakhstan currently also adheres to UN Security Council Resolution 1540 (UNSCR 1540), has joined the International Code of Conduct against Ballistic Missile Proliferation (the Hague Code), and has applied for membership in the Missile Technology Control Regime (MTCR). The country retains a small arsenal of short range ballistic missiles (SRBM) tipped with conventional high explosives (HE), which are designed and employed for conventional military operations rather than deterrence. Additionally, Kazakhstan possesses an active space program with significant dual-use infrastructure relevant to missile development. Table 1 shows the basic design characteristics of Kazakhstan's ballistic missile arsenal. Kazakhstan's arsenal is limited to two Soviet era SRBM's: the OTR-21 "Tochka-U" (NATO: SS-21-B "Scarab-B"; and the R-300 "Elbrus" (NATO: SS-1C "Scud-B"). The Tochka-U is a solid propellant, inertial guidance, battlefield SRBM (BSRBM) designed for tactical operations. It employs either a high explosives fragmentation or submunition warhead designed for use against troop concentrations and critical infrastructure targets such as airfields and military facilities. The combined characteristics of a solid propellant, inertial guidance, a low Circular Error Probable (CEP) (95m), and the road mobile vehicle, make the Tochka-U an adequate battlefield weapon. The Scud-B, a liquid propellant, inertial guidance, road mobile SRBM, is one of the most proliferated ballistic missiles in existence. Fielded with high explosives, a high Circular Error Probable (450m) makes the Scud-B an imprecise and therefore ineffective battlefield weapon. Kazakhstan inherited its ballistic missiles from the Soviet Union, and the country currently does not have an active missile program. Kazakhstan does possess significant infrastructure, through its space program, with dual-use utility for missile development and testing. This includes relevant academic and research institutions, assembly buildings, launch pads, propellant production facilities, and radar and tracking components/equipment, among others. To further facilitate development of its space industry and technological exchange, Kazakhstan has applied to become a member of the Missile Technology Control Regime. However, the MTCR has not accepted new members since the 2004 accession of Bulgaria. 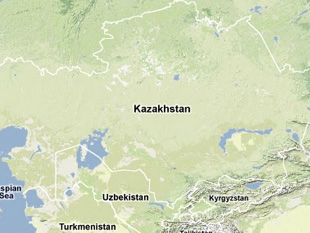 Kazakhstan is home to the Sary-Shagan missile range, Russia's primary anti-ballistic missile (ABM) testing site. Sary-Shagan is strategically located 1,600km from Kapustin Yar, Russia's primary ICBM test site, and is equipped with advanced tracking and radar equipment. Sary-Shagan is currently under lease to the Russian Ministry of Defense. A few kilometers away from the missile range, in Balkhash, is a Russian early warning missile defense radar system. A squadron of 40 Tu-95 heavy bombers equipped with X-55 [NATO Designation AS-15A 'Kent'] ALCMs, tipped with 370 warheads, was stationed at Shagan Aerodrome, Semipalatinsk Test Site. Russia removed the 40 Tu-95 bombers and ALCMs from Shagan Aerodrome in February 1994. All 370 warheads associated with the Tu-95 bombers were removed by 25 April 1995. Seven obsolete 1955-vintage bombers left behind by Russia were dismantled by August 1997 under the CTR program. "The Republic of Kazakhstan Space Activity," Asia-Pacific Regional Space Agency Forum, www.aprsaf.org. Decree of the Government of the Republic of Kazakhstan, "Strategicheski Plan Natsialnova Kosmicheski Agyenstva Respublika Kazakhstana na 2011-2015 [Strategic Plan of the National Space Agency of the Republic of Kazakhstan for 2011-2015]," National Space Agency of the Republic of Kazakhstan, Kazcosmos.gov.kz, 17 February 2011. "Centers: Baikonur: Regions and Facilities," RussianSpaceWeb.com. "Baikonur Tekhnicheskoye Opisaniye [Baikonur Technical Writings]," www.atlasaerospace.net. Vladimir Karnozov, "Russia and Kazakhstan extend space deal," Flight International, 20 January 2004, p. 25, www.lexis-nexis.com. "Baikonur Cosmodrome," NASA: Space Station Assembly, www.nasa.gov. Anatoly Zak, “Baiterek,” Russian Space Web, 3 December 2013, www.russianspaceweb.com. Julia Rutz, "Projects to Advance Kazakh Space Industry Near Completion," Astana Time, 4 February 2015, www.astanatimes.com. Frank Mooring Jr., "KazSat-1 Launched," Aviation Week & Space Technology, 26 June 2006, p. 17, www.lexis-nexis.com. "Kazakhstan admits losing satellite," RIA Novosti, 2 December 2008, en.rian.ru. "Khrunichev Loses KazSat-1," Satellite Today, 4 December 2008, www.lexisnexis.com. Rachel Scharmann, "Russia Dual Launches KazSat 3 and Loutch 5V Satellites," Satellite Today, 30 April 2015, www.satellitetoday.com. "Russia to deliver S-3oo air defense system to Kazakhstan," RIA Novosti, 8 December 2010, en.rian.ru. "Kazakhstan poluchit bezplatna do dyesati kompleksov S-300 [Kazakhstan to receive up to 10 S-300 complexes free of charge]," Vesti, 10 December 2010, Vesti.kz. "Kazakhstan to get first S-400 air defense system after 2015," Tengri News, 1 February 2012, en.tengrinews.kz. “Law on Ratification of Agreement between Russia and Kazakhstan on Creation of a Joint Regional Air Defense System,” Russian Presidential Executive Office, 30 December 2013, eng.kremlin.ru. “CTR Assistance - What It Does: Kazakhstan,” US Department of Defense, Undated, www.dod.mil. Anatoly Zak, “Dnepr,” Russian Space Web, August 22, 2013, www.russianspaceweb.com; Anatoly Zak, “Rockot,” Russian Space Web, 11 September 2013, www.russianspaceweb.com. “On Kazakhstan's Efforts to Join Missile Technology Control Regime” Embassy of Kazakhstan to the United Kingdom, November 2010, www.kazembassy.org.uk. "Kazakhstan lifts ban on launches of Russian ballistic missiles," RIA Novosti, 8 November 2011, en.rian.ru. "Russia and Kazakhstan Agree 3-Year Space Center Deal," RIA Novosti, 25 December 2013, en.rian.ru.